This evening Venus and Jupiter shine brightly through the haze in the western sky. 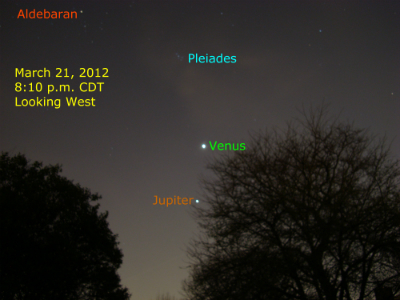 The Pleiades star cluster appears above Venus. Aldebaran, the brightest star in Taurus, also appears in this view. This digital image was made with a 30-second time exposure. 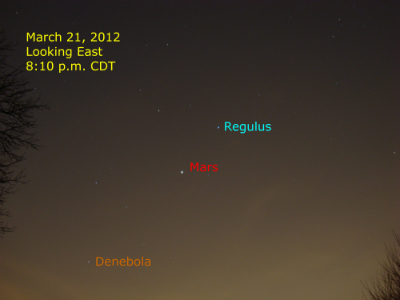 Looking back to the east at the same time, Mars is well up in the eastern sky among the stars of Leo. Regulus and Denebola, stars in Leo, appear in this view. This digital image was made with a 30-second time exposure.